The explosion of information and data available to the world has made those who can interpret it indispensable. The explosion in the amount of data available has made those who can interpret this most important asset indispensable. The Master of Applied Statistics is a high-quality programme combining taught and research courses at postgraduate level. It is a 180 credit qualification able to be completed in 18 months full time. Your lecturers in the Master of Applied Statistics are experts in their field, leading international statistical research, with practical applications for worldwide issues. They are researching and applying their expertise in areas like computational techniques to understand and forecast the spread of diseases, and developing statistical models of poverty and malnutrition in third-world countries. As a Massey Master of Applied Statistics student you will learn the professional practice of statistics, and the quantitative skills to conduct robust statistical analyses that are effective in the real world. You will gain competence in the use of statistical software, including the R package. You will graduate with the skills to draw appropriate conclusions from a statistical analysis and be able to communicate them to both a statistical or non-statistical audience. When you study statistics at Massey, you’ll benefit from the multi-disciplinary environment, and world-leading faculty with expertise in all the sciences. You will be able to investigate a topic of interest to you, through the completion of an extended research project. After completing a Bachelor of Technology at Massey I worked for four years at New Zealand Steel near Waiuku in South Auckland doing production planning, production reporting and programming. After spending 11 years out of the professional workforce, I was fortunate to re-start my career doing sensory statistics at Fonterra’s Research and Development Centre in Palmerston North. I spent several years working as a part-time sensory panellist tasting milk and cheese products. This work was mostly routine statistical analyses, and I realised that to become involved in projects which involved more challenging statistics I would need to do further study. As a result of guidance from Professor Martin Hazelton at Massey, I studied the Master of Applied Statistics (MApplStat) programme as a part-time student. I was fortunate that I was able to attend weekly classes in Palmerston North, as I enjoyed the interaction with the lecturers and other students. I particularly enjoyed assignments which were more open-ended, some of which involved choosing a ‘real world’ data set and applying various statistical techniques to find which was most suitable. I consider myself to be applied rather than theoretical, so I was very fortunate to then get a job at AgResearch in Palmerston North. It is great being part of a team of statisticians at the Grasslands site, and part of the larger statistics team across the four locations. Some of the statisticians at AgResearch have worked there for 40 years! It is great being able to draw on their experience. My job involves design and analysis of experimental trials involving grasses, trees and animals, and my master’s research project has led me to become involved with the growing area of genomic selection research on forages such as ryegrass. It’s a great time to be a statistician! The Wall Street Journal said in 2013 that “Data Crunchers [are] Now the Cool Kids on Campus”. ‘Big Data’ has opened up a huge range of career opportunities for those who are talented in working with figures. Statistics skills can be applied in almost any industry. 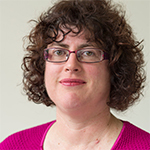 Dr Hazelton is the current President of the New Zealand Statistical Association and Chair of the Statistics and Bioinformatics Group (part of the Institute of Fundamental Sciences at Massey University). His research interests extend across applied and theoretical statistics work, especially the development and application of statistical methods in medicine and for spatial processes. Dr Hazelton has been awarded a New Zealand Royal Society Marsden Fund grant for 2015-2018 to work in the areas of statistical modelling and inference in transportation science. He is a Principal Investigator in Massey's Infectious Disease Research Centre (IDReC), where his work involves modelling the spread of disease in space and time, with a particular focus on identification of anomalous outbreaks. Dr Hazelton was also the recipient of the 2014 Littlejohn Research Award, the New Zealand Statistical Association's premier research award.